Share the post "Black Petunia: Add Some Intrigue And Elegance To Your Garden"
Petunia is genus of 35 species of flowering plants in the family Solanaceae of South American origin, closely related to tobacco, cape gooseberries, tomatoes, deadly nightshades, potatoes and chili peppers. The popular flower of the same name derived its epithet from the French, which took the word petun, meaning “tobacco,” from a Tupi–Guarani language. Petunias are one of the most popular garden bedding flowers, often grown as annuals. They are tender perennials in USDA hardiness zones 9 to 11. Petunia flowers are bright, colorful and lively, bloom from spring until frost, and scent the air with lovely fragrance. They’re very easy to grow, both in the garden and in containers. Most of the varieties seen in gardens are hybrids. There are literally hundreds of named petunia varieties. They fall into four distinct categories, based on flower size and growth habit. But breeding companies continue to excite the gardeners by offering new varieties to add more intrigue and elegance to the gardens. We all know, the black color is quite rare in the plant world. Black in a flower has always intrigued one gardeners and repulsed others. On July 12, 2010, the new black flower, which has got the name ‘Black Velvet’ was the star of the Greenhouse Grower’s Association Evening of Excellence. It earned two awards that evening: Industry’s Choice and Reader’s Choice. Even earlier, at the California Spring Trials in April, it was the talk of the show. In 2011 the first ever black Petunia went on sale for the first time in British garden centers. Black petunias were developed by flower breeding company Ball Colegrave in the UK, which is part of the Ball Horticultural Company based in West Chicago, Illinois. The new flowers were developed using natural breeding techniques. Plants and flowers are supposed to be bright and colorful, but look how gorgeous and captivating the black flowers of petunia are! It took 4 years for Ball flower breeder Jianping Ren to develop the variety, and it wasn’t an easy task. “The black color did not exist in Petunias before, so it has to come from the right recombination of a novel color mutant and multiple regular color genetic backgrounds. It is difficult and very different from breeding true blue flowers because at least there are some blue flowers you can start with,” Jianping Ren says. “It’s unique and unusual, and opens the door for more new colors.” (ballcolegrave.co.uk) Victorian and Edwardian gardeners dreamt of black flowers like this and never got to experience them! Everyone knows that black goes well with anything, so you can pair Petunia ‘Black Velvet’ with bright-pink, white, yellow, orange, red flowers for a lively and striking contrast. Black petunia with its dark, velvety blooms look immensely beautiful in pots, containers, window boxes, or borders on its own as well. 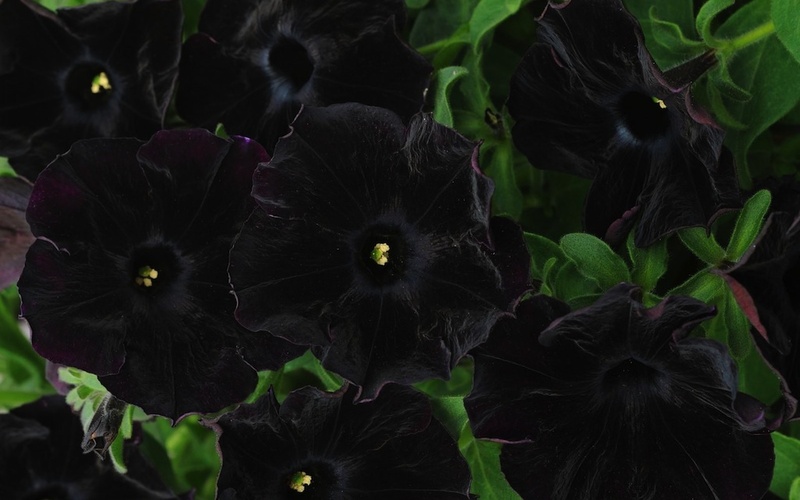 Is ‘Black Velvet’ petunia really black? Black Velvet can change the color pattern under stress conditions: the flower may become more purple, but once positioned in a stable environment with consistent light levels and no large temperature swings, the flower coloring will stabilize. Interestingly, that some gardeners have noticed that the flowers become more purple if exposed to the direct bright sunlight, when others say it happened in low light. What is your experience with black petunia? Moisture: Keep evenly moist. Drought-tolerant. Fertilizer: Best if fertilized regularly (or with a slow release fertilizer). Avoid late applications of B-Nine growth regulator, to ensure a strong color show. These upright, mounded and disease-resistant plants are early-blooming, have a tightly branched habit and are filled with color all season long. Perfect for 3 – 5 in (9 – 13 cm) pots. Current varieties of the black petunia are not trailing and create a mound of green foliage topped with deep black blooms. Little note: You may come across petunia ‘Black Velvet’ in catalogs or at the garden centers, it is the same petunia as ‘Black Cat’ sold by W. Atlee Burpee & Co.
Black petunias are available in several varieties: ‘Black Velvet’ (‘Black Cat’), ‘Phantom’ and ‘Pinstripe’. • ‘Black Velvet’ (‘Black Cat’) has pure black petals atop mounding foliage. This plant thrives in full sun to partial shade. 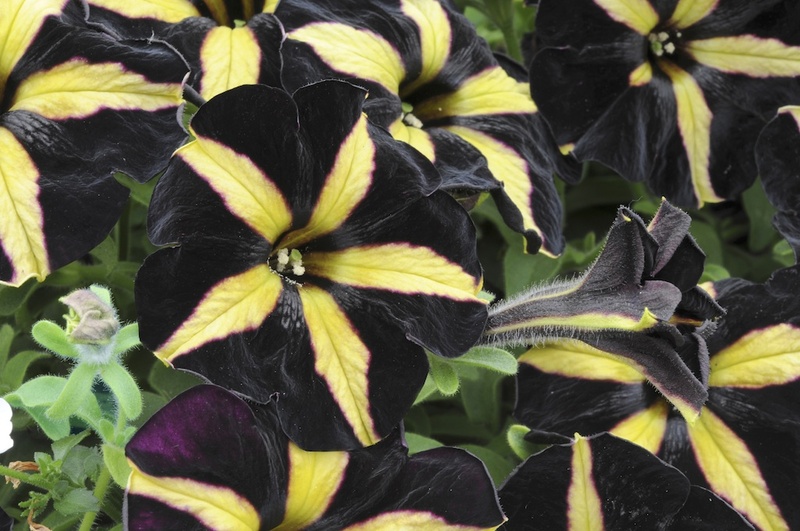 • ‘Phantom’ features pure black petals with a striking yellow star in the center. Growth is similar to ‘Black Velvet’ (‘Black Cat’), but this petunia can tolerate a bit more sun. • ‘Pinstripe’ features rich black petals with colorful pink or red stripes similar to ‘Phantom’. Stripes are thinner giving this petunia a royal appearance. 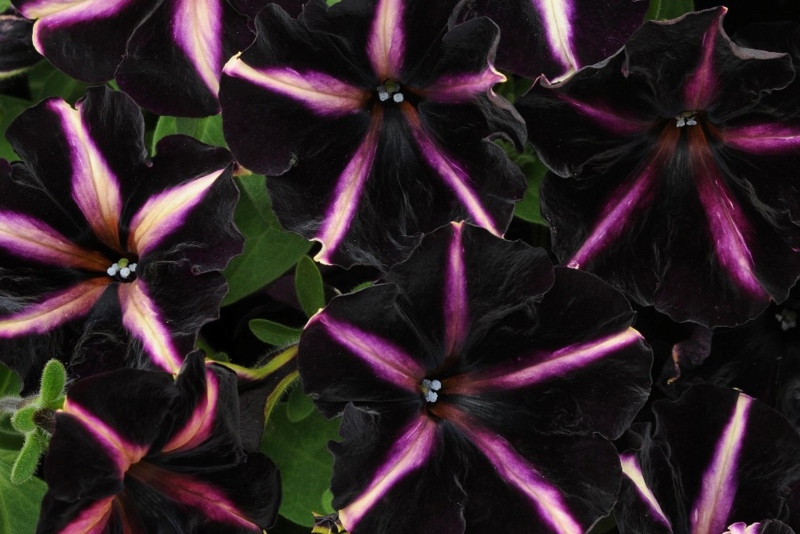 • ‘Black Magic’ petunia – is said to revert less, keeping its deep midnight coloration throughout a long season of bloom. Grows 10 – 16 in. Full sun. It seems you can see just a hint of very dark burgundy/purple in the ‘Black Velvet’ flowers, but it’s somewhat more noticeable at the edges of the star in ‘Phantom, and most noticeable on ‘Pinstripe’, where the “black” background bleeds into the stripes profusely. Do you grow black petunias in your garden? What is your experience with this plant? Please share with other fellow gardeners in the comments below! Do you sell ‘Black Velvet’ (‘Black Cat’), ‘Phantom’ or ‘Pinstripe’ seeds for sale? You can place your advertisement here. Contact us now!